Mr. V. K. Narasimhan served as the editor of Sanathana Sarathi, Prasanthi Nilayam ashram’s monthly magazine, from 1987 till he passed away in 2000. He was an internationally known journalist and had earlier held the posts of Deputy Editor of The Hindu; and Editor of the Indian Express, Financial Express and Deccan Herald. A man of high intellect, he was well-known and respected as one of the principal leader-writers on Indian politics and economics for over three decades. He was also intimately associated with various socio-welfare organisations in different capacities and has even authored several books. The following article originally appeared in ‘Golden Age’, a commemorative compilation of tributes to Bhagavan on his 60th birthday in 1985. As one grows in years, one begins to count one's blessings. And for a man approaching the psalmist's three score and ten, whose life has been crowded with many exciting experiences, spread over many continents, the blessings seem countless. 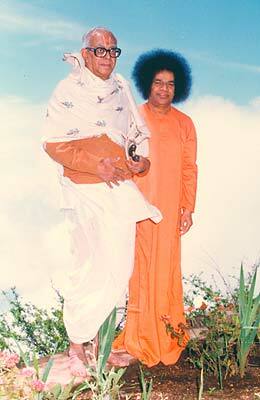 The crowning blessing of them all is the boundless benediction of Sri Sathya Sai Baba in my sixty-fifth year. I shall reserve for another occasion the story of the circumstances which led to my shifting from New Delhi to Bangalore to write the last chapter of my career as a journalist. There is, as Shakespeare says, "a divinity that shapes our ends, rough-hew them how we will." 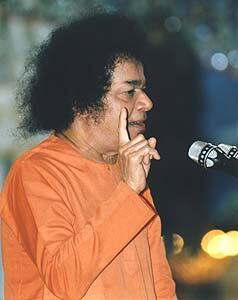 As one whose faith in the Law of Karma has grown with my experience of the vicissitudes of life, as they have affected individuals, institutions and nations, I cannot get away from the conviction that in some mysterious way, it was Baba who brought me to Bangalore. He would have done that so that I could realise what I had been inwardly seeking all these years, but had not found so far. From my first meeting with Baba in December 1977, I have experienced a spiritual kinship — a guru-sishya (Master-disciple) relationship with Him. I had not experienced this with anybody else, certainly not with the same intensity, or of the same order. I have been familiar in a way with the writings of many great seers and philosophers, from Valmiki and Plato to Vivekananda, Aurobindo, Marx and Gandhi, and each of them, to some extent, has influenced my attitude to life. But after meeting Baba, I have felt that in a unique way, He represents a synthesis of all these teachers and even transcends them by the power of His personality and the universality of His message. Baba is still too much of a mystery for me. And to attempt describing Him would only be a fragmentary and utterly inadequate description of what He is and what He means to me. 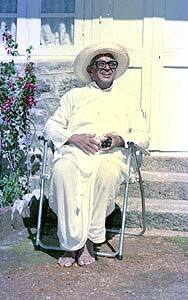 The other day, Dr. Bhagavantam, the eminent scientist, described Him as "the inexplicable Baba." Many of the things He does, which have been described as His miracles, are inexplicable in terms of the known laws of science. But to me, the significance of Baba lies not in these supernatural phenomena, but in the innumerable normal activities He does, and in the message He offers to a materially affluent, but morally and spiritually impoverished world. Increasingly, as a result of my experiences in India and elsewhere, I have come to the conviction that only a powerful spiritual impulse that transforms the mass of mankind from a struggling breed, engaged in the pursuit of personal pelf and power, to a cooperative loving community, which has learnt to divinise every thought and action, can rescue our tortured and divided world from perpetual conflict, fear and suffering. It may seem that there is nothing new in this view and that it is as old as the Vedas and as recent as Mahatma Gandhi. This is obvious, but what is not so obvious is the fact that the world needs an authentic personality who can generate such a spiritual impulse on a scale wide enough to effect a new spiritual revolution in the history of mankind. I am convinced that by His teachings and His actions, Sri Sathya Sai Baba is today the single most potent force behind such a spiritual transformation. In India itself, I expect that in a few years, the thousands of young men and women who will be going out into the world from the Sathya Sai educational institutions in different parts of the country will be functioning as moral and spiritual catalysts in every sphere where they may be working, bringing a new spirit of dedication and selfless service to their work and elevating the moral tone and quality of life in their respective communities. The influence which Baba wields over these students is comparable to nothing which any teacher or leader wields over his students or followers. No one who has witnessed the disci­pline, the devotion and the attitude of reverence displayed by these Sai students can fail to realise that they are bound to become the most significant reforming influences in Indian society, which today is reeking with corruption, indiscipline and immorality. Baba's great work in the educational field seems to me the only hopeful sign in an otherwise heart-breaking and depressing landscape. The country needs today a new dedicated and morally courageous leadership, not only in politics, but in every walk of life — education, the administration, business and even in religion. People are hungering for such a leadership. Wherefrom can it come except from a source which is utterly unpolluted and unquestionably sacred and spiritual in every sense of the word? When I see eminent judges, scientists, administrators, educationists, businessmen and even politicians, with their known cynical unconcern for moral scruples, seeking the advice or the blessings of Baba, I feel that He is a unique transforming force in our country today. When I also see that He has an ever-widening circle of devoted believers in many countries, I realise that His message is not for India alone but for all people everywhere. There is one reason why Baba, despite the importunities of His non-Indian followers, has deliberately chosen not to go abroad. He has felt that unless India itself is made a real exemplar of the life of the spirit, there is no point in His going abroad to spread His message. In all His discourses Baba has been concerned about the declining morals in India, and the widespread ignorance of the great truths of Indian spirituality and culture. His major concern, in the conduct of His educational institutions and in all His discourses, is to revive faith in the great values proclaimed by Indian sages and avatars, not merely as intellectual concepts but as living truths to be practised in everyday life. For Baba, there is no dichotomy between precept and practice. Again and again, He exhorts all those who come to Him to practise at least a tenth of what they learn or profess. In the cosmic plan, it cannot be an accident that Baba was born in a little-known Andhra village, which has become today a great centre of pilgrimage for spiritual seekers from every part of the world. Last year, when I was at Puttaparthi for the birthday celebrations of Baba, I found that the foreigner seated next to me in the great assembly hall packed with devotees, was a coal miner from Sydney. I asked him how he happened to come to Puttaparthi all the way from Australia and what he found in Baba which he could not find in any other god-man including Christ. He told me that he was an immigrant from Yugoslavia, and that he heard about Baba from a group of Sai devotees in Sydney. While he had read about Christ and others in the Bible and other books, he had found in Baba a living example of the divine in human form. "You have all gathered here from the distant corners of our country, from every State and every linguistic unit, in order to pool your separate skills of hand and head for the successful completion of this great task which will give food and happiness to crores of brothers and sisters for centuries. This is a great chance for all of you, a chance that comes to few, however skilled they might be. "It is a rare chance that comes to few in any country. The lake that will fill this gorge with the waters of the Krishna when you build the dam across it will be your Nishkama karma samudra, an ocean of selfless effort. You will all see it and feel its coolness, depth and strength. It will gladden you and inspire you, and make you feel that your life has been worthwhile. "Don't go about this holy work in a haphazard way, without Sraddha and Bhakthi (sincerity and devotion). You have, by that Sraddha and Bhakthi, to curb this mighty river, which has carved its way through these hard rocks since the beginning of time, and you have to obstruct its speed and its rage for the benefit of man and beast. Man has by his skill and daring to make this wayward child of Nature halt for a while, and pass on. This task will become lighter if man curbs his own way ­ wardness and his own egoism, anger, malice, envy, greed, and the roaring flood of his passions. "Dam them in your own hearts, and canalise them into useful fields. Utilise the force of those qualities to gain better results from your efforts and Sadhana. Grow in those fields the fruit of Shanti and Prema (Peace and Love). That is the agriculture that Sadhakas know, and which your own forefathers practised for ages. I have come to remind you of it and to tell you all of the need once again to follow that path." Jawaharlal Nehru (the first Prime Minister of India) once described the dams, power houses and factories that were being built under the five-year plans as the temples of free India. But he did not realise that it is not the mere erection of these structures in brick and mortar that makes them the temples of "socialist, secular" India. It is the spirit in which they are built and the purposes for which they are used that will endow them with sacredness. And what we have been witnessing all these years is the lack of genuine spirit of dedication and service in the implementation of all our well-meaning schemes. That is why we find ourselves in a situation in which there is so much bitter conflict at all levels, so much of corruption, indiscipline and unscrupulousness in every sphere.  Only the recovery of respect for moral values, based upon the conviction that all life should be a consecration to the divine, can rescue the country from the morass in which it has been plunged by three decades of unethical politics and lack of integrity in every sphere of life — education, business, the administration and even in ordinary human relations. 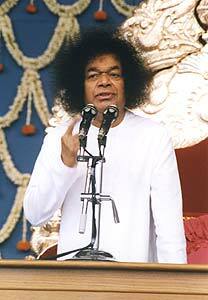 It is in this situation that Sri Sathya Sai Baba's life and message are supremely relevant and vital to our country. He is the Light that must guide us "amidst the encircling gloom."